Pete Taylor is a preacher with the flaw of gambling and making bets even if it is only for the good of the church and others. But one bet lands him with a rich man’s unruly half Peruvian daughter, Eva Manterro. Also see the recipe page for Eva and Pete’s special recipes they make and eat in the novel. Watch the booktrailer from the first three books of this series too. “Who would have thought the top of the world held nothing but flies?” Peter Rock Taylor took in a deep breath of the fresh mountain air, standing nearly nine thousand feet above sea level having just climbed to the top of Huayna Picchu. The Peruvian teens he mentored and his Peruvian minister friend Rodrigo from his mission was with him. He’d made it to the top of the peak first, and the rest of them climbed up onto the flat rock behind him. “Pedro, you win another bet,” said Rodrigo, calling Pete by his Spanish name. Rodrigo was a Peruvian man about Pete’s age of thirty-two who helped him bring troubled teens back on track, and aided him in his missionary work building homes and helping the poor mountain people farm. “That’s right, and since I won, all of you will be helping to plow the fields as soon as we return to Cusco this afternoon,” Pete told the teens in their native language. Groans went up from the group of a dozen kids, as they sat down to catch their breath. Pete’s mission was small and the troubled Peruvian teens he worked with helped with his ministries since he had a severe lack of funds. “Padre, look at the view of Machu Picchu below,” said Carlos, one of the boys who knew English, pointing to the glorious view that took Pete’s breath away. One thousand feet below them lie the ancient ruins of the Incan Empire. Majestic peaks covered in green, poked up through the leftover morning fog. Streams of sunlight shone down upon the Incan ruins and terraced land, making Pete feel as if God himself were nearby. They’d set out to climb the peak this morning, which was something most tourists liked to do when they visited the magnificent site. Pete was a minister, one of the twelve sons of the late minister, Webster Taylor from the little town of Sweet Water, Michigan. Pete had come to Peru five years ago when his father died and his brothers all split up, going their own ways. But just a few months ago, his mother died, and he’d gone home to pay his last respects. That’s when he realized that Sweet Water was really where he needed to be preaching, not here in this remote part of the world, though he loved the people and land. But home and with his brothers is where his heart lie and where he needed to be. Today was his last day in Peru, as tomorrow he’d catch a plane and go back to the States and take over the non-denominational church his father started years ago called the Twelve Apostles Church. “Are you sure you won’t stay and continue your ministries in Peru for awhile, Pedro?” asked Rodrigo. “You realize as soon as you leave – the mission will close down with no one to run it or to continually round up funds to keep it going.” He was a short, barrel-chested man just like the rest of the mountain natives. His black hair was cut in a bowl shape around his head and he wore one of the alpaca wool caps with earflaps in bright colors made by the native women. “I know, and that thought alone makes me die a little every day,” Pete told him. “I wish I could stay, but I need to go home. Yes, I’m really going to miss this place.” Pete walked up to the edge of the rock and looked down the steep drop. “I understand,” said Rodrigo with a shake of his head. “You want that sense of family and I can’t blame you. You are like family to all of us, but you are right. This is not where you belong. I’ve seen a sadness in your eyes since you’ve returned from the States, amigo. ¿Quieres una esposa. Y tú? The man asked him in Spanish if he wanted a wife. Pete just stared at the beauty of the vast mountains peeking out from the thin wisps of rolling clouds below him. He’d prayed to God for an answer and to give him a sign that he was doing the right thing, as well as to send him the wife he was meant to have. But with all his prayers, he still didn’t have a woman in his life he could call his wife, and he felt like it was time to take matters into his own hands. It had rained slightly this morning, and he spotted double rainbows that appeared as the sun broke through the clouds. He was so high that the rainbows were below him. He wondered if this was somehow a sign from God that his life was about to get better. Perhaps his answer was at the end of the rainbow. “They did. Actually, six of them have gotten married in the past few months,” he admitted. “Eva, come back before you fall,” a man’s voice cried out from behind them. “Padre. ¡Mira!” shouted one of the girls from Pete’s group. She pointed out at a ridge atop the mountain. Pete turned his head to see a young woman that looked no older than twenty sitting there on a rock that jutted out over a steep drop straight down. She had her feet dangling over the edge and was swinging her legs back and forth. She was also dressed like a boy in overalls and a long sleeved rugged top that reminded him of long underwear. Her hair trailed down her back in the form of a long black braid, and she wore a baseball cap on her head. “Eva, get over here right now!” shouted the man, pulling himself up to the top of the steep mountain trail. “Daddy, don’t tell me what to do or I might just jump,” came the girl’s smug reply. Pete slowly moved toward her, wondering if she meant what she said. He’d worked with troubled teens for many years now, and he knew by the tone of her voice she sounded more like she was being defiant, and demanding attention rather than really thinking about killing herself. “You’d better get off that ridge right now or you’ll be sorry.” The man shot forward toward the girl, but Pete put his arm out and stopped him. “This is Padre Pedro,” said Rodrigo rushing up behind them. “He is a missionary who works with troubled teens.” He splayed his arm backwards to show him the group of kids who were with them. “They used to be like her, but because of this man, they have changed,” Rodrigo told him. “Really.” The man stroked his chin in thought. He was tall and slim and looked and talked like an American, and Pete knew he wasn’t from South America. But his daughter dangling her feet off the edge of the cliff had long black hair and the golden skin of a native of the land. “Let me try, sir. Please,” said Pete, laying a comforting hand on the man’s shoulder. 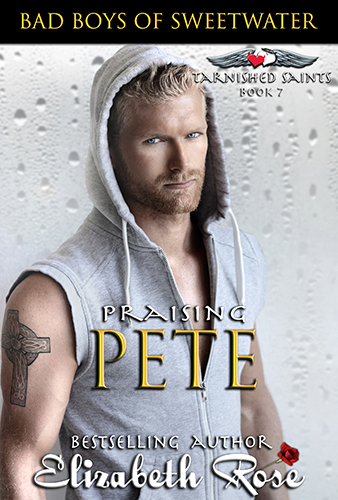 “I’m a missionary, not a priest,” Pete told him. You can just call me Pete.” He made his way across the small space, coming up slowly behind the girl named Eva, being careful not to startle her in the process.